This guest post is by AnnMaria De Mars, President & Founder of 7 Generation Games. Thousands of learning apps have hit the market and the impact on math and science scores is a big, fat zero. With games that teach everything from multiplication to chemical bonding, this should be the smartest generation ever. Actually, since the invention of the iPad, the change in scores of American students in math and science has been – well, nonexistent. His company “pivoted” before delivering a single educational game. Meanwhile, 7 Generation Games has repeatedly shown significant results in improving math scores. Here’s what we know about making learning games where people actually learn. Learning games are a $1.8 billion market, but only about 10% of that is spent by schools (the rest coming from the consumer market). It is NOT (as some game developers like to tell themselves), because schools are run by a bunch of technical morons stuck in the last century. The problem is often the exact opposite: teachers are not impressed with “games” that are little more than electronic flash cards. 1. What is it that the student is supposed to learn from this game? 2. How will you know whether they have learned that? Let me give you an example from our own games. Fish Lake teaches Common Core standards addressing fractions. It begins with the most basic standard, that a unit fraction is 1/b when a whole is divided into b equal parts. After a few problems and examples for that standard, the player moves gradually up to the next. We have an extensive (and deathly boring to create) matrix on our website that identifies each and every one of these standards, where it is taught and measured. No teachers wakes up every morning and says, “You know what I want to do? A task analysis that breaks down a math problem into all of the prerequisite skills, then assess each one separately and analyze any wrong answers.” Teachers go through this agonizingly tedious process because they understand that it is important to build on information students already know. You can’t expect a student to find an average until he knows how to add a column of numbers and how to divide. At 7 Generation Games, we looked at what the best teachers do and wrote that into our code. When a student can’t solve a problem, an excellent teacher doesn’t give the answer, she gives a hint. This behavior can be easily coded. The best teachers also connect lessons – for example, what you were learning in math class comes up again in history. How long did it take the average ship to get to America in the 1900s? Is the average time an ice cube melts different if it is in direct sunlight than the average when the ice is under a box? Could you use ice on a ship to keep food from spoiling? Any teacher will tell you that setting students up to fail is a horrible idea yet millions of people play games that are really, really hard to win. Why do players keep playing? It’s easy to get started in a good game. Everything from Donkey Kong to World of Warcraft starts off simply enough that novice players don’t get frustrated. Players know what they are supposed to do to succeed in the game. Players move up in skill as they go along, and can often pick their own pace. Good games also challenge more advanced players. For an example of a game that both new and experienced players can enjoy at their own pace, download the Fish Lake demo and canoe the rapids. Some players hold down the shift key, speed past rocks and logs to get to the end. This is very difficult and you’ll probably die. Other players hug the shore as they navigate very slowly around the obstacles. 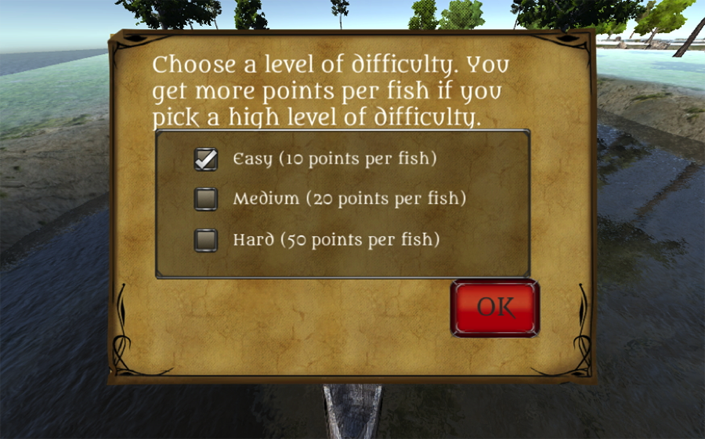 In Forgotten Trail, a player can choose from easy, medium and hard levels. This makes perfect sense in a classroom, but who has time to make three lesson plans every day? Creating a game where students can select their level of difficulty for both game play and subject matter (say, math) is a task where game developers and teachers are a match made in heaven. Just in case a player might over- or underestimate ability, a good designer could create a game where wrong answers lead to instruction, and slightly easier problems, while correct answers lead to slightly harder problems. Quality games combine creativity within the game experience. Exploration and choice can be built into a game in many ways – programmable Lego bricks, allowing the player to make just about anything; bonus levels, alternate paths. Aztech Games is a bilingual game that teaches statistics. Players complete math challenges to move up levels and win the game, and can play in Spanish or English. Within levels are bonus questions on other areas of mathematics and even quizzes on the meaning of English idioms, like raining cats and dog, or translating English to Spanish. Correct answers can earn “gold” to be spent in the game, open doors to new mini-games or lead to secret game “cheats” that help the player survive. Showing your game to teachers after it is finished isn’t asking for input, it’s asking for their blessing. Paying contract developers to create a game idea that you had may get you a playable level or two, but it isn’t going to get you a good game. There is a way to stem the flood of educational games that either are not good education or not good games: make games where educators and developers are equal parts of the team. Put as much money into posing questions, assessing answers and correcting errors as you do into graphics, sound and coding. Spend as much time on game design and usability testing as you do on aligning with Common Core standards. This method isn’t easy, quick or cheap – but that’s true of most solutions that work, now isn’t it?